Raita looks wonderful! I have posted a raita too! Is that red garnish Paprika? The whole bowl looks tempting! @ Harini - you may want to attempt the same with broiled snakegourd / chowchow - that also tastes yum ! Even with the bottle gourd this pachadi comes out fine.Looks delicious!!!! Yummy. I have to try it this way sometime. Yummy. I usually broil the eggplants. Never knew they can be steamcooked for raita. i can eat eggplants only if they r made in this method.. looks good.. 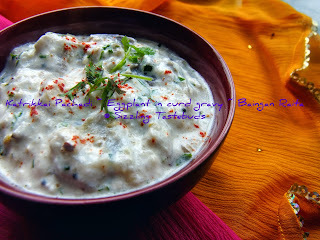 Awesome looking eggplant raita.. Love it. Raita looks fabulous! Thanks for linking it to the event.